XCU® slow-release fertilizer provides gradual, steady nutritional uptake for up to 10 weeks of plant response. 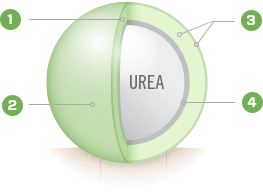 XCU® fertilizer has the highest nitrogen (N) content (43%) and lowest sulfur content (4%) of any polymer-coated sulfur-coated urea (PCSCU) on the market. The value is more area can be covered per application using less fertilizer, which is more efficient and economical. Also, with less N lock-off more of the applied N is taken up and utilized by turfgrass or plants in the expected time frame. 1. Soil moisture penetrates the sulfur and polymer coatings. 2. Nitrogen (N) begins to dissolve creating pressure within the granule. 3. With previous-technology SCUs, this pressure cracked the coating, immediately releasing N (catastrophic release). The inner polymer coating of XCU® fertilizer results in a hybrid of diffusion-based release and catastrophic release, resulting in a more consistent release profile. 4. After N release, the sulfur eventually breaks down into the soil where it may be taken up by the plant. XCU® slow-release fertilizer has been widely used by superintendents, LCOs, municipal turf managers and professional landscapers to economically and efficiently promote a plant response of health, growth and color for up to 10 weeks per application. 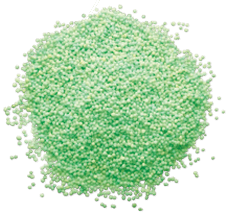 XCU® fertilizer is available in sizes to fit a number of fertilization programs. Only a portion of the N applied as conventional fertilizer is taken up by plants, but enhanced efficiency fertilizers (EEFs) increase N uptake. Increasing the XCU® fertilizer content in blends results in more efficient N use; the more XCU® fertilizer used, the better your blends work. *Above data from University of Florida and Pennsylvania State University. The underlying data in university studies was provided under a Research trial Financial Support Agreement with the universities. The universities mentioned do not endorse or recommend any product or service.